The TNF superfamily (TNFSF) of proteins are cytokines involved in diverse immunological and developmental pathways. Little is known about their evolution or expression in lower vertebrate species. Bioinformatic searches of Zebrafish, Tetraodon, and Fugu genome and other teleost expressed sequence tag databases identified 44 novel gene sequences containing a TNF homology domain. 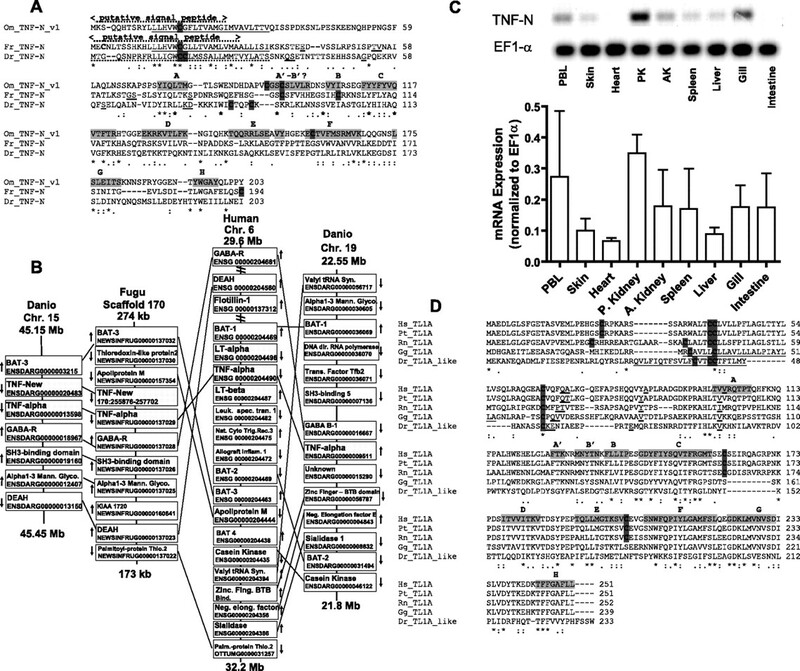 This work reveals the following: 1) teleosts possess orthologs of BAFF, APRIL, EDA, TWEAK, 4-1BBL, Fas ligand, LIGHT, CD40L, RANKL, and possibly TL1A; 2) the BAFF-APRIL subfamily is enriched by a third member, BALM, unique to fish; 3) orthologs of lymphotoxins α and β were not clearly identified in teleosts and are substituted by a related ligand, TNF-New; 4) as many as four TRAIL-like genes are present in teleosts, as compared with only one in mammals; and 5) T cell activation ligands OX40L, CD27L, CD30L, and GITRL were not identified in any fish species. Finally, we characterize mRNA expression of TNFSF members CD40L, LIGHT, BALM, APRIL, Fas ligand, RANKL, TRAIL-like, and TNF-New in rainbow trout, Oncorhynchus mykiss, immune and nonimmune tissues. In conclusion, we identified a total of 14 distinct TNFSF members in fishes, indicating expansion of this superfamily before the divergence of bony fish and tetrapods, ∼360–450 million years ago. Based on these findings, we extend a model of TNFSF evolution and the coemergence of the vertebrate adaptive immune system. Ligands within the TNF superfamily (TNFSF)4 are effector proteins involved in a variety of pathways ranging from inflammation, lymphocyte maturation, and apoptosis to lymphoid and epithelial tissue development (1, 2). These ligands are type II membrane proteins with an intracellular N terminus and an extracellular C terminus. The majority of these ligands are membrane bound, while many members also contain a proteolytic cleavage site to generate soluble forms (3). The C terminus is modestly conserved between TNFSF ligands (20–30%) and is referred to as the TNF homology domain (THD) that is typically composed of 10 β-strands (designated A, A′, B′, B, C, D, E, F, G, and H) (1). Structurally, each TNFSF ligand’s conical trimer is formed by the THD region of three monomers. After trimer formation, the ligands can bind respective receptor(s) to initiate signaling. Eighteen distinct TNFSF genes have been identified in humans, and nearly all members are physically located on the chromosome adjacent to one or two additional TNFSF genes. It has been proposed that this clustered organization of human TNFSF members on MHC-paralogous chromosomes 1 (FASL, GITRL, and OX40L), Chr 6 (LTB, TNF, and LTA), Chr 9 (CD30L and TL1A), and Chr 19 (LIGHT, CD27L, and 4-1BBL) arose from two ancestral TNFSF members within the proto-MHC, followed by partial cis-duplication, and subsequently by large-scale genomic duplications. This was followed by discrete deletion and/or either cis- or trans-duplications (4). Similarly, the remaining genes on chromosomes X (EDA and CD40L), Chr 3 (TRAIL), Chr 13 (BAFF and RANKL), and Chr 17 (APRIL and TWEAK) may have also evolved by localized or genome-wide duplication with rearrangement by translocation. Collette et al. (4) postulate that the duplication and evolution of the TNFSF and TNFRSF families paralleled the emergence of the adaptive immune system. Teleosts (ray-finned, bony fish) possess an immune system with B cells and T cells, primary and secondary lymphoid organs, and are capable of adaptive responses to pathogens. Teleosts, however, display a number of characteristics different from the mammalian immune system: the anterior kidney (AK) is the primary hemopoietic organ; they lack germinal centers and lymph nodes, genes of the MHC are dispersed across chromosomes, and they fail to undergo isotype switching. Given that TNFSF members play critical roles in many of these aspects of immune system organization and function, identification of teleost TNFSF orthologs and paralogs is of interest to better understand immune system evolution and the immunological pathways elicited to pathogens. To date, only a limited number of TNFSF members have been identified in teleosts. A TNF has been cloned and characterized in many fish species and has been found to be similar to mammalian TNF-α (TNFSF2) (5, 6, 7, 8, 9, 10). Other genes that have been characterized in teleosts include a TRAIL-like (11), EDA (12), and BAFF (TNFSF13b) genes (G. D. Wiens, S. Gahr, F. Rodriguez, Y. Palti, C. Rexroad, and G. Glenney, manuscript in preparation). A homolog of mammalian LT-α (TNFSF1) has not been described in fish and has been suggested to not exist (13). However, Savan et al. (14) recently describe a novel TNF gene (TNF-New) found both in fugu, Takifugu rubripes, and zebrafish, Danio rerio, that is similar to LT-A due to its genomic proximity to TNF-A and similar transcriptional orientation. While this manuscript was in preparation, Kono et al. (15) identified two orthologs of TNF-New in rainbow trout and concluded that the proteins are more similar to LT-β (TNFSF3) than to LT-α due to their absence of a signal sequence and their phylogenetic clustering with other mammalian and Xenopus LT-β proteins. In an effort to better understand the evolution of TNF superfamily, we systematically searched teleost expressed sequence tag (EST) and genomic databases for additional orthologs and paralogs. In this study, we have assimilated 71 teleost sequences, of which 44 are novel, that contain a THD, and we determined their relationship to mammalian TNFSF members by phylogenetic and synteny analyses. We have examined expression of TNFSF members in rainbow trout as it is a commercially important species and a good model species for functional analysis (16). Our analyses identified orthologs of mammalian TNFSF members and also genes that appear to be unique to teleosts. One rainbow trout protein has similarities to both BAFF (TNFSF13b) and APRIL (TNFSF13) and shares sequence identity to a protein identified in the threespine stickleback, Gasterosteus aculeatus (12). This gene will be referred to as BAFF-APRIL-like molecule (BALM). We also identify four TRAIL-like molecules in teleosts. Finally, we use gene synteny, intron/exon organization, predicted secondary structure, and molecular phylogeny to compare all known teleost TNFSF members and extend a model of the evolution of this superfamily. Full (CD40L, RANKL, and TRAIL-like) and partial (FasL, BALM, and Om TNFSF-N) Oncorhynchus mykiss cDNA sequences were obtained from rainbow trout EST libraries at the National Center for Cool and Coldwater Aquaculture (Kearneysville, WV). To complete partial sequences, RNA ligase-mediated rapid amplification of the 5′ end of FasL and BALM using GeneRacer 5′ Primer with FasL R1 or BALM R1 (RNA ligase mediated-RACE, GeneRacer kit; Invitrogen Life Technologies) was conducted. Nested PCR was conducted to amplify the desired genes (FasL (GeneRacer 5′ Nested Primer, FasL-like Rext.) and BALM (GeneRacer 5′ Nested Primer, BALM R1)). All 5′ RACE procedures were conducted on the total RNA extracted from splenic tissue of an unstimulated rainbow trout. To complete the initial cDNA Om TNFSF-N sequence, four sets of primers (Om TNFSF-N F1, R1, F2, R2, F3, and R3) were used to establish a complete open reading frame (ORF) from total RNA extracted from the AK, posterior kidney (PK), and gill of an unstimulated rainbow trout. Amplification was performed in 20-μl samples containing 4.6 μl of PCR grade water (Sigma-Aldrich), 2 μl of 10× PCR buffer, 1.2 μl of 25 mM MgCl2, 2 μl of 2.0 μM dNTP (Sigma-Aldrich), 4 μl of forward and reverse primers (5 μM), and 0.2 μl of Hotstar Taq polymerase (5 U/μl). PCR products were extracted from 1% agarose gels with QIAquick Gel Extraction Kit (250) (Qiagen). Cloning of initial Om TNFSF-N products was conducted in pCR2.1-TOPO vector chemically transformed into Transforming One Shot TOP10 Competent Cells and selected on 50 μg/ml kanamycin containing Luria-Bertani plates. To complete the 3′ untranslated region (UTR), SuperScript III reverse transcriptase was used to generate cDNA from the splenic total RNA of a Flavobacterium psychrophilum (strain CSF259-93) intramusculature injected rainbow trout (GeneRacer Oligo dT Primer). This cDNA was initially amplified by PCR (Om TNFSF-N F3, GeneRacer 3′ Primer), followed by a nested PCR (Om TNFSF-N F2, GeneRacer 3′ Nested Primer). To obtain the initial cDNA of the rainbow trout Om LIGHT gene, primers were designed from a Salmo salar (S. salar LIGHT F1 and R1) LIGHT sequence. Only a partial LIGHT-like sequence was obtained from the total RNA extracted from the kidney and spleen of an unstimulated rainbow trout. To complete the LIGHT sequence, 5′ RACE (GeneRacer 5′ Primer, LIGHT R1) was conducted. To complete the 3′ end, the same SuperScript III reverse transcribed cDNA described above to amplify the Om TNFSF-N 3′ end was used. This cDNA was initially amplified by PCR (S. salar LIGHT F1, GeneRacer 3′ Primer), followed by a nested PCR (S. salar LIGHT F2, GeneRacer 3′ Nested Primer). Two variant sequences were found by these processes, so two forward primers and two reverse primers were designed in variable regions (Om LIGHT F1, R1, F2, and R2). PCR products were cloned and sequenced to establish true variants. Cloning of trout BAFF and APRIL will be described elsewhere (G. D. Wiens, S. Gahr, F. Rodriguez, C. Morrison, Y. Palti, C. Rexroad, and G. Glenney, manuscript in preparation). All product amplifications, unless stated otherwise, were performed in 50-μl samples containing 32 μl of PCR grade water (Sigma-Aldrich), 5 μl of 10× Pfu PCR buffer, 1 μl of 10 mM dNTP (Sigma-Aldrich), 1 μl of 0.5% gelatin, 4 μl of forward and reverse primers, and 1 μl of PfuULTRA Hotstart DNA Polymerase (2.5 U/μl). PCR products were extracted from 1% agarose gels with the QIAquick Gel Extraction kit (Qiagen). All cloning, unless stated otherwise, was conducted in pCRII-Blunt-TOPO vector chemically transformed into Transforming One-Shot Competent Cells. EST library-competent cells containing pCMV · SPORT 6 and pT7T3D-PAC vectors were grown overnight in 5.0 ml of Luria-Bertani broth (Difco) containing 100 μg/ml ampicillin. Plasmid DNA was extracted with the QIAprep Spin Miniprep kit (Qiagen) and sequenced using an ABI 3100 Sequencer. Contigs were established, and extension primers were used until two complete sequences from either clonal inserts or PCR products were obtained. PCR primers and extension primers are listed (Table I⇓). All custom primers were made by using primer designing software (http://frodo.wi.mit.edu/cgi-bin/primer3/primer3_www.cgi). Seventy-one teleost sequences, which possessed distinctive THDs, were identified (Table II⇓), and all sequences are included in Supplementary Data 1. 5 The teleost sequences were aligned with known mammalian, avian, and amphibian TNFSF ligand sequences (Table II⇓ and Supplementary Data 2). 5 For the phylogenetic analysis, a total of 124 full-length sequences and 9 partial sequences were used. All partial sequences contained a complete THD (1). The rainbow trout sequences characterized in this article were translated using ExPASy proteomics and sequence analysis tools (http://us.expasy.org/tools/dna.html). All variant forms were included in the analysis unless identical ORFs were observed. Sequences were aligned using Clustal X (matrix-blosum). Alignment files were imported into the molecular evolutionary genetics analysis (MEGA) program, version 2.1. A phylogenetic tree was constructed using the Neighbor-Joining method (Poisson correction), with the bootstrap resampling technique to test the reliability of the inferred tree (1000 replications). Known mammalian, chicken, and frog sequences included in the phylogenetic analyses were as follows: Hs_LT-α, EMBL:OTTHUMT00000076237; Mm_LT-α, GenBank: P09225; Mmx_LT-α, GenBank:AAF34868; Bt_LT-α, EMBL:ENSBTAG00000000016; Oc_LT-α, EMBL:ENSOCUG00000006694; Xt_LT-α, EMBL:752:311946:312803; Hs_TNF-α, GenBank:P01375; Mm_TNF-α, GenBank:P06804; Xt_TNF-α, EMBL:752:293085:294756; Hs_LT-β, GenBank:Q06643; Pt_LT-β, EMBL:6:32052431:32054074; Mm_LT-β, GenBank:P41155; Pm_LT-β, GenBank:AAP34710; Mm_LT-β, GenBank:AAF34865; Me_LT-β, GenBank:AAD41774; Xt_LT-β, EMBL:752:236178:237176; Hs_OX- 40L, GenBank:P23510; Pt_OX-40L, EMBL:ENSPTRG00000001692; Bt_ OX-40L, EMBL:ENSBTAG00000002894; Cf_OX-40L, EMBL:ENSCAFG00000014587; Mm_OX-40L, GenBank:P43488; Hs_CD40-L, GenBank:P29965; Mm_CD40-L, GenBank:P27548; Xt_CD40-L, EMBL:ENSXETG00000017494; Hs_FasL, GenBank:P48023; Mm_FasL, GenBank:P41047, Gg_FasL, EMBL:ENSGALP00000004854; Hs_CD27L, GenBank:P32970; Bt_CD27L, EMBL:ENSBTAG00000009752; Cf_CD27L, EMBL:ENSCAFG00000018630; Mm_CD27L; GenBank:O55237; Mmu_CD27L, EMBL:ENSMMUG00000011042; Hs_CD30L, GenBank:P32971; Pt_CD30L, EMBL:ENSPTRG00000021293; Bt_CD30L, EMBL:ENSBTAG00000025782; Cf_CD30L, EMBL:ENSCAFP00000005002; Dr_4-1BBL, EMBL:GENSCAN00000025997; Fr_4-1BBL, EMBL:NEWSINFRUG00000160956; Ga_4-1BBL, EMBL:GENSCAN00000042857; Hs_4-1BBL, GenBank:P41273; Bt_4-1BBL, EMBL:ENSBTAG00000020500; Mm_4-1BBL, GenBank: P41274; Rn_4-1BBL, GenBank:AA13993; Tn_4-1BBL, EMBL:GSTENG00026327001; Hs_TRAIL, GenBank:P50591; Mm_TRAIL, GenBank:P50 592; Gg_TRAIL_v1, GenBank:NM_204379; Gg_TRAIL_v2, GenBank:NP_989922; Hs_RANKL, GenBank:O14788; Mm_RANKL, GenBank:O35235; Xt_RANKL, EMBL:ENSXETG00000025365; Hs_TWEAK, GenBank:O75888; Mm_TWEAK, GenBank:O54907; Hs_APRIL, GenBank:O75888; Rr_APRIL, GenBank:NP_001009623; Mm_APRIL, GenBank:Q9D777; Hs_BAFF, GenBank:Q9WU72; Mm_BAFF, GenBank:Q9WU72; Gg_BA FF, GenBank:NM_204327; Hs_LIGHT, GenBank:O43557; Mm_LIGHT, GenBank:Q9QYH9; Hs_TL1A, EMBL:OTTHUMP00000022739; Rn_ TL1A, EMBL:ENSRNOG00000008930; Gg_TL1A, EMBL:ENSF00000000980; Mm_TL1A, ENSMUSG00000050395; Xt_TL1A, ENSXET00000026658; Hs_GITRL, GenBank:Q9UNG2, Bt_GITRL, EMBL:ENSBTAG00000016468; Cf_GITRL, EMBL:ENSCAFG00000014590; Rn_GITRL, EMBL:ENSRNOP00000035225; Mm_GITRL, GenBank:Q7TNY2; Hs_EDA, GenBank:Q92838; Mm_EDA, GenBank:O54693; Gg_EDA, EMBL:ENSGALP00000007125; Xt_EDA, EMBL:117:1427238:1508975. Novel Xenopus sequences included within the phylogenetic analysis were as follows: Xt_BAFF, EMBL:42:1929088:1912327; Xt_FASL, CX366641; Xt_GITRL-like, EMBL:84:2095534:2101116; Xt_OX-40L-like, EMBL:85:2186432:2198707; Xt_TRAIL_v1, DV034135; Xt_TRAIL_v2, Scaff.239:55915:61329, GenBank:BJ618569. To compare amino acid identity and similarity, we used the global sequence alignment program Needle (http://sbcr.bii.a-star.edu.sg/emboss/). Synteny analysis of TNFSF ligand member genes was conducted by comparing gene order and orientation. Schematic diagrams were constructed between fish and human chromosomes (Ensembl version 33, September 2005). Only teleost members with sequenced genomes were used for synteny analyses. To predict secondary structure of BALM and TNF-New, we used PredictProtein (http://cubic.bioc.columbia.edu/predictprotein/). For sequence alignment, we incorporated known secondary structure from the following crystal structures: 1ALY of human CD40L (17), 1XU1 of murine APRIL bound to Taci (18); 1JTZ of human TNF-related activation-induced cytokine/RANKL (19); and 1D2Q of human TRAIL (20). For TWEAK, LIGHT, 4-1BBL, and FasL, β-sheet predictions from Bodmer et al. (1) were used. Tissues (80.0 mg) were collected from five adult rainbow trout (2.0 kg) and placed into RNAlater (1.0 ml). Blood was drawn into heparinized collection tubes. Peripheral blood leukocytes were isolated by collecting cells at the interface using Histopaque 1077 (500 × g for 40 min). RNA was extracted from 30.0 mg of tissue using a RNeasy Mini Extraction kit (Qiagen), and cDNA was prepared as described previously (21). Semiquantitative amplification was performed in 20-μl samples containing 2.0 μl of cDNA, 4.6 μl of PCR grade water (Sigma-Aldrich), 2 μl of 10× PCR buffer, 1.2 μl of 25 mM MgCl2, 2 μl of 2.0 μM dNTP (Sigma-Aldrich), 4 μl of forward and reverse primers (5 μM), and 0.2 μl of Hotstar Taq polymerase (5 U/μl). PCR products were extracted from 1 to 1.5% agarose gels with QIAquick Gel Extraction Kit (250) (Qiagen) and sequenced. A total of 71 teleost proteins containing TNF-homology domains was identified from our sequencing efforts, database searches, and the published literature (Table II⇑). Of these, 44 have not been described previously. Accession numbers for all genes are listed in Table II⇑, and amino acid sequences used in the phylogenetic analysis are included in the Supplementary Data 1. 5 The majority of the teleost sequences formed clades, defined by bootstrap values >70%, with mammalian TNFSF members (Fig. 1⇓). These clades include BAFF (TNFSF 13b), APRIL (TNFSF 13), EDA, TWEAK (TNFSF 12), FasL (TNFSF 6), LIGHT (TNFSF 14), CD40L (TNFSF 5), RANKL (TNFSF 11), TRAIL (TNFSF 10), and TNF-α (TNFSF 2). In some trees, teleost 4-1BBL (TNFSF9) sequences grouped with high bootstrap values with mammalian 4-1BBL sequences, whereas in other trees, it grouped at the base of the 4-1BBL sequences. A single TL1A-like protein sequence was identified in zebrafish, but this protein (Dr_TL1A-like) failed to group closely with mammalian TL1A. Rather, this sequence grouped most closely with the sequence of Xenopus TNF-α. This protein does not appear to be zebrafish TNF-α because there are two other zebrafish genes that have higher sequence similarity and have been previously annotated as TNF-α, and we designated them here as Dr_TNFα_v1 and Dr_TNFα_v2. We also identified a third variant sequence in GenBank, Dr_TNFα_v3, which is a putative splice variant of TNF-α_v2. These three Dr_TNFα protein sequences cluster closely with other teleost TNF-α proteins. Interestingly, mammalian TNF-α and LT-α branch more closely to each other than to the teleost TNF-α sequences, suggesting a recent, common evolutionary origin for mammalian TNF-α and LT-α before the fish and amphibian divergence. An unrooted phylogenetic tree of mammalian, avian, amphibian, and teleost TNF ligand family members (TNFSF). Colored boxes outline TNFSF ligand families found to have fish representatives, whereas dotted boxes demarcate fish-only sequences within each ligand family. Groups of TNFSF members with >70% bootstrap values are considered a clade and putatively share a common ancestor. Note some clades also share high bootstrap values with other clades, suggesting an evolutionary relationship between members such as BAFF-BALM-APRIL-EDA, FasL-LIGHT, RANKL-TRAIL, and TNF-α-LTα. Only confidence probability values >50% are listed. 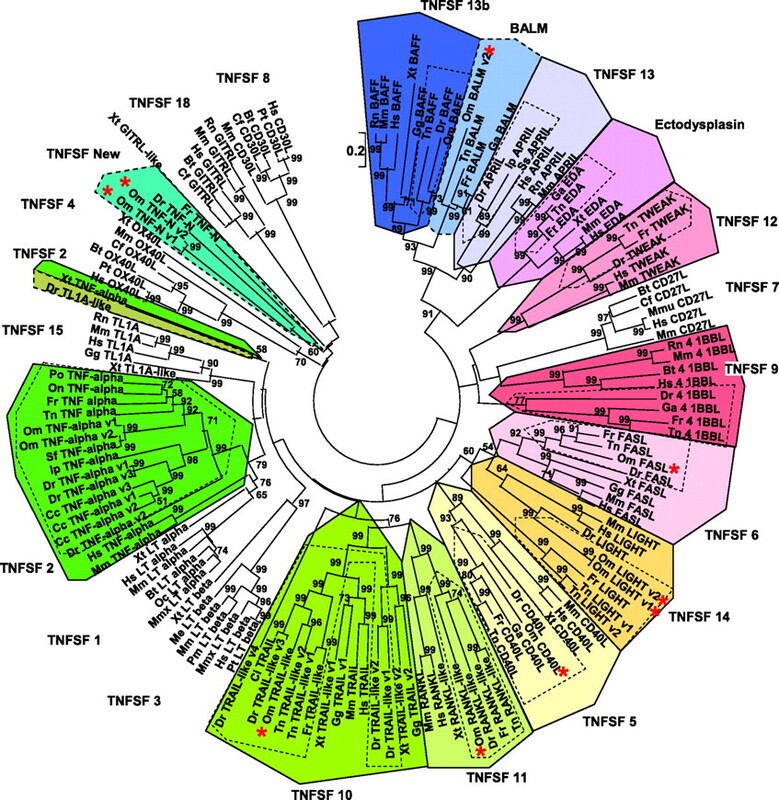 The tree was constructed with full-length amino acid sequences (except partial sequences for T. nigroviridis BALM, FasL, EDA; F. rubripes LIGHT, CD40L, 4-1BBL; D. rerio 4-1BBL; O. mykiss FasL; X. tropicalis LT-α, LT-β, TRAIL-like v1, and TL1A) by the neighbor-joining method in MEGA 2.1 (1000 bootstrap replications-Poisson correction). A F. rubripes EDA sequence was not included within the tree due to unresolved intron/exon borders. O. mykiss APRIL was also not included due to its recent cloning but does not alter the phylogenetic analysis. Rainbow trout, O. mykiss, sequences characterized in the current article are indicted with a “∗.” Abbreviations: Bt, Bos taurus; Cf, Canis familiaris; Ci, Ctenopharyngodon idella; Cc, Cyprinus carpio; Dr, D. rerio; Fr, F. rubripes; Gg, Gallus gallus; Ga, Gasterosteus aculeatus; Hs, Homo sapiens; Ip, Ictalurus punctatus; Mmu, Macaca mulatta; Me, Macropus eugenii; Mmx, Marmota monax; Mm, Mus musculus; Oc, Oryctolagus cuniculus; Om, O. mykiss; On, Oreochromis niloticus; Pt, Pan troglodytes; Po, Paralichthys olivaceus; Pm, Peromyscus maniculatus; Rn, Rattus norvegicus; Ss, S. salar; Sf, Salvelinus fontinalis; Tn, T. nigroviridis; Xt, X. tropicalis. In many clades, multiple sequences were obtained from the same fish species. These include TRAIL, TNF-α, LIGHT, TNF-New, and BALM (Fig. 1⇑, Table II⇑, and Supplementary Data 1). 5 A total of four TRAIL-like sequences was identified from Zebrafish; however, Dr_TRAIL-like_v4 is more distantly related and only grouped weakly with other TRAIL and RANKL sequences. There were two groups of teleost protein sequences that were distinct: BALM, which is related to BAFF and APRIL, and TNF-New. The position of the TNF-New clade was unstable in different trees and branched deeply between putative teleost New orthologs. There were six mammalian TNFSF members that consistently did not group closely with teleost sequences: CD27 (TNFSF 7), LT-β (TNFSF 3), TL1A (TNFSF 15), OX40L (TNFSF 4), GITRL (TNFSF 18), and CD30L (TNFSF 8). Similar trees were obtained using maximum parsimony analyses and by systematically adding or removing sequences from the phylogenetic analyses. To confirm the phylogenetic analysis and further extend the characterization of these molecules, we determined amino acid identity/similarity, gene synteny, intron/exon conservation, secondary structure prediction, and finally, mRNA expression of select teleost TNFSF members in rainbow trout. Most of the fish TNFSF ligands shared highest percent similarity with other members of their respective clade determined by phylogenetic analysis (Table II⇑ and Supplementary Data 2). 5 Local gene synteny, defined as two or more common flanking genes, was identified between teleost and humans TNFSF members, including BAFF, APRIL, EDA, TWEAK, 4-1BBL, FasL, LIGHT, CD40L, and RANKL. For teleost TRAIL-like and TL1A-like members, the phylogenetic or sequence identity analyses suggested TNFSF family member grouping, but there was less convincing syntenic support, and thus, we use the “like” suffix for these genes. Below, we discuss sequence characteristics of each of the clades and mRNA expression in rainbow trout. Amino acid alignment, synteny, and expression of BALM. A, Alignment of deduced amino acid sequence for two TNF superfamily member variants from rainbow trout (Om_BALM_v1 and Om_BALM_v2) with the threespine stickleback, G. aculeatus (Ga_BALM). Identical (∗) and similar amino acids (: , .) are identified. Cysteines and individual β-strands (A-H) are shaded. Putative signal peptide is indicated by < >, whereas putative TMDs are indicated by solid underlines. A polybasic region and a putative cleavage site are marked by double underline (RNKR). Stop codon in 5′ end of Om_BALM_v1 is indicated (∗). The locations of introns within the gene sequence of Ga-BALM are denoted by a short, bold underline. If a codon is formed by the junction of two exons, the single amino acid formed is underlined. If the intron is located between two codons, then amino acids on either side of the junction are underlined. Rainbow trout BALM introns are not known. B, Diagram of synteny of genes between Stickleback, Tetraodon, and human EDA/BALM locus. The TNF ligand members are highlighted in gray boxes, whereas transcriptional orientation is indicated by arrows. C, Graphic representation of semiquantitative PCR analysis (using primers BALM F2 and BALM R2) of BALM expression across a panel of healthy adult rainbow trout tissues. Error bars indicate SD (n = 5). Interestingly, BALM is directly downstream of EDA in stickleback, Tetraodon, and Fugu (Fig. 2⇑B and data not shown). There is additional synteny surrounding the Tetraodon and stickleback BALM genome loci with GAP Junction Connexin, Melatonin receptor, and Neuralized 1 genes downstream, and EDA just upstream in the same transcriptional orientation. Searches of sequence surrounding human EDA for a human BALM ortholog were unsuccessful; however, there was a weak sequence similarity with an ovarian tumor otubain EST that does not have a THD (Supplementary Data 2). 5 Presently, BALM appears to be unique to teleosts. We examined expression of rainbow trout BALM in adult fish and the highest constitutive expression of BALM was observed in the spleen, PBL, PK, and AK, suggesting a potential immunological role (Fig. 2⇑C). To a lesser extent BALM expression was observed in the gill, heart, skin, liver and intestinal tissues. The finding of BALM adjacent to EDA prompted us to examine whether CD40L was also present. In mammals, CD40L is located on chromosome X as is EDA, albeit at a large distance ∼55 Mb. Surprisingly, similar to mammals, we were able to locate a TNFSF member in Tetraodon and zebrafish on the same chromosome as teleost EDA in addition to BALM (Fig. 3⇓A and Table IV⇓). There was synteny of three upstream and downstream Tetraodon genes with human CD40L, supporting the designation as teleost CD40L. Furthermore, sequences from trout and pufferfish grouped with high bootstrap values to Xenopus, chicken, and mammalian CD40L (Fig. 1⇑ and data not shown). Three rainbow trout cDNA clones were sequenced (Table III⇑) encoding an identical 261-aa CD40L-like peptide (Fig. 3⇓B). Amino acid alignment, synteny, and expression of CD40L. A, Diagram of synteny of genes between Fugu, Tetraodon, and human CD40L locus. B, CD40L amino acid sequence alignment. Putative TMDs are indicated by solid underlines, cysteines and individual β-strands (A-H) are shaded, and the locations of introns within the gene sequence are denoted by a short, bold underline as described in Fig. 2⇑. Amino acids directly involved in CD40L-CD40 in mammals are indicated (∩) (22 ). A potential glycosylation site (Asn240) described in human CD40L is indicated (‡) (22 ). Abbreviations: Hs, Homo sapiens; Mm, Mus musculus; Xt, X. tropicalis; Om, O. mykiss; Tn, T. nigroviridis. C, Semiquantitative PCR analysis (primers CD40L F1 and CD40L R1) of CD40L expression as described in Fig. 2⇑. Through single and double amino acid substitutions, five amino acids (Gln220, Arg203, Lys143, Tyr145, and Tyr146) have been found to be important for CD40L-CD40 binding in mammals (22). 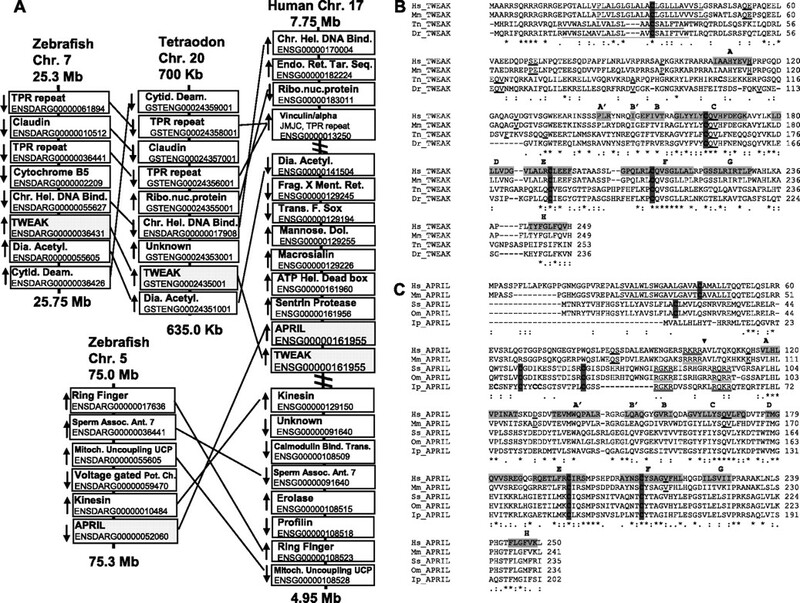 None of these residues were found to be conserved in alignment analysis of teleost O. mykiss, S. salar, Tetraodon nigroviridis, Fugu rubripes, D. rerio, P. olivaceus, and G. aculeatus CD40L sequences (Fig. 3⇑B and data not shown). However, two of the five residues in human CD40L (Lys143 and Tyr145) were conserved in Xenopus tropicalis (Fig. 3⇑B). A potential glycosylation site (Asn240) has also been described in human CD40L and is conserved in murine, chicken, and amphibian CD40L. This glycosylation site is not found in any of the seven teleost sequences examined but is always a tryptophan (Fig. 3⇑B and Supplementary Data 1). 5 A striking difference between mammalian CD40L and teleosts are the locations of cysteines in the THD. In human and mouse, there is a disulfide bond between the C and F β-strands, whereas in fish, two cysteines are located in the E and F strands similar to human BAFF, APRIL, and EDA. Modeling of the secondary structure of O. mykiss CD40L was attempted with human CD40L as a template. Although the first four β-strands (aa 120–158) of the O. mykiss CD40L structure were unable to be modeled, we did find that Cys213 and Cys224 in the fish E and F β-strands likely form a disulfide bond, suggesting that protein structural changes accompanied the further evolution of this locus. The highest constitutive expression of rainbow trout CD40L was observed in the spleen, PBL, gill, PK, and AK. To a lesser extent, CD40L expression was observed in the heart, skin, liver, and intestinal tissues (Fig. 3⇑C). TWEAK and APRIL are both located on human Chr 17 within 700 bp of one another. Sequences resembling both genes were identified in teleosts; however, these two genes are not linked in Zebrafish, and linkage is uncertain in Tetraodon (Fig. 4⇓A), suggesting that this close proximity between these two genes arose after the fish-tetrapod divergence. The locations of the cysteines in the teleost and mammalian molecules are highly conserved (Fig. 4⇓, B and C). Unusual aspects of teleost APRIL are the presence of two putative furin cleavage sites and the lack of an identifiable transmembrane (TM) region (Fig. 4⇓C). Rainbow trout APRIL is weakly expressed in the spleen, gill, intestine, skin and heart tissues (data not shown). Rainbow trout TWEAK has not yet been identified. Diagram of synteny of genes between zebrafish, Tetraodon, and human APRIL/TWEAK-like locus (A). B, Alignment of TWEAK sequences. Putative TMDs are indicated by solid underlines, cysteines and individual β-strands (A-H) are shaded, and the locations of introns within the gene sequence are denoted by a short, bold underline. C, APRIL amino acid sequence alignment. The furin recognition site in mammalian APRIL molecules are underlined, and the cleavage site is denoted with (▾). This precise cleavage site is not conserved in Atlantic salmon, trout, or catfish APRIL; however, there are two putative recognition sites (Arg-X-Lys-Arg) proximal to this site (double underlined). Abbreviations: Hs, Homo sapiens; Mm, Mus musculus; Tn, T. nigroviridis; Dr, D. rerio; Ss, S. salar; Om, O. mykiss; Ip, Ictalurus punctatus. Single gene sequences were identified from pufferfish, zebrafish, trout, and frog that grouped with mouse and human RANKL TNFSF members with high bootstrap values (Fig. 1⇑). Synteny analysis of Fugu and Tetraodon both showed isocitrate dehydrogenase downstream of RANKL, with a kinase anchor 11, and ATP GTP-A binding motif A located upstream of RANKL all with the same orientation (Fig. 5⇓A). Human Chr 13 also had a kinase anchor 11 and ATP GTP-A binding motif genes upstream of human RANKL; however, the ATP GTP-A binding motif was not similar in orientation. Om_RANKLs’ highest identity and similarity percentages were with human TRAIL (Table II⇑), contradicting the phylogenetic tree grouping with RANKL orthologs (Fig. 1⇑). However, Tn_RANKL had higher similarity (41.5 and 25.6% Id) with Hs_RANKL than with Hs_TRIAL (38.1 and 25.6% Id). Furthermore, there is conservation of a cysteine in the C β-strand among all RANKL members (Fig. 5⇓B) that is not found among TRAIL members, while all TRAIL sequences have a conserved cysteine in the E-F loop that coordinates trimerization of the protein (Fig. 6⇓B). This cysteine is not found in any of the RANKL sequences, albeit there is a cysteine in the fish sequences in the F-β strand that is in close proximity and may represent an ancestral location. In Tetraodon, both RANKL and BAFF are located on the same chromosome similar to the organization found in humans. A unique aspect of the teleost RANKL sequences is the large variation in the size of the putative C-D loop, which may require the disulfide bond between the C and F β-strands for stability. Amino acid alignment, synteny, and expression of RANKL. A, Diagram of synteny of genes between Fugu, Tetraodon, and human RANKL locus. B, RANKL amino acid sequence alignment. Putative TMDs are indicated by solid underlines, cysteines and individual β-strands (A-H) are shaded, and the locations of introns within the gene sequence are denoted by a short, bold underline. Murine cleavage site (!) is marked, whereas associated sequence is marked by a dotted underline (IVGPQR-FSGAPA). Abbreviations: Hs, Homo sapiens; Mm, Mus musculus; Xt, X. tropicalis; Tn, T. nigroviridis; Om, O. mykiss; Fr, F. rubripes; Dr, D. rerio. C, Semiquantitative PCR analysis (primers RANKL F1 and RANKL R2) of RANKL expression across a panel of healthy adult rainbow trout tissues. Amino acid alignment, synteny, and expression of TRAIL-like gene(s). A, Diagram of synteny of genes between a Fugu, two Tetraodon, and the human TRAIL loci. The TNF ligand members are highlighted in gray boxes, whereas transcriptional orientation is indicated by arrows. B, TRAIL amino acid sequence alignment. Putative TMDs are indicated by solid underlines, cysteines and individual β-strands (A-H) are shaded, and the locations of introns within the gene sequence are denoted by a short, bold underline. Abbreviations: Hs, Homo sapiens; Mm, Mus musculus; Gg, Gallus gallus; Fr, F. rubripes; Tn, T. nigroviridis; Om, O. mykiss; Dr, D. rerio. C, Semiquantitative PCR analysis (primers TRAIL-like F1 and TRAIL-like R1) of TRAIL-like expression across a panel of healthy adult rainbow trout tissues. The highest constitutive expression of rainbow trout RANKL was observed in the spleen, PBL, skin, heart, and AK. This expression pattern is similar to mammalian RANKL, which is expressed in the spleen, blood, bone, and vasculature. To a lesser extent, trout RANKL-like expression was observed in the gill, PK, liver, and intestine tissues (Fig. 5⇑C). By phylogenetic analysis, RANKL groups closely with TRAIL. In humans, there is only a single TRAIL gene while two genes have been identified in chickens. In this study, we identify as many as four TRAIL-like genes in Zebrafish in agreement with a recent sequence and functional analyses by Emion et al. (23). Synteny analysis of Fugu and Tetraodon both showed serine/threonine protein kinase, cohesin subunit SA stromal Ag SCC3 homolog, propionyl CoA carboxylase, and Zn-finger genes located downstream of Fugu TRAIL-like and Tetraodon TRAIL-like v2 with the same orientation, except for serine/threonine protein kinase (Fig. 6⇑A). Arylacetamide deacetylase and serine/threonine phosphatase genes were both located upstream of Fugu and Tetraodon TRAIL-like v1 with the same orientation (Fig. 6⇑A). Human Chr 3 had the arylacetamide deacetylase gene upstream of human TRAIL and in the same orientation as Fugu TRAIL-like and Tetraodon TRAIL-like v1 and TRAIL-like v2. Interestingly, all of mammalian, bird, frog, and fish sequences contain a cysteine immediately adjacent to the E β-strand (Fig. 6⇑B). In crystal structures of human TRAIL, this cysteine coordinates a zinc atom involved in trimerization of the molecule. All the TRAIL sequences also contain two cysteines in the stalk region of the molecule immediately adjacent to the TMD. All teleost TRAIL molecules have an extended A-A′ loop that in human TRAIL is involved in receptor binding. This loop may have expanded in comparison to other TNFSF members due to the presence of an intron in the middle of the A-A′ loop, allowing the addition of sequence due to shifting of the splice acceptor and donor sites (Fig. 6⇑B). From rainbow trout, an insert of 1396 bases was obtained from clone tcay0005b.j.21 encoding a predicted 291 aa peptide (Table III⇑). This sequence, by phylogenetic analysis, groups most closely with Tetraodon TRAIL-like variant 2 and zebrafish TRAIL-like v3 protein (Fig. 1⇑). The highest constitutive expression of rainbow trout TRAIL-like was observed in the spleen, gills, and PK. To a lesser extent, TRAIL-like expression was observed in the heart, liver, intestine, AK, skin and PBL tissues (Fig. 6⇑C). In humans, three TNFSF members are clustered on Chr 19: LIGHT, CD27L, and 4-1BBL. We find two of the three also cluster together in fish. Sequences from Tetraodon, Fugu, and trout grouped with high bootstrap values with mammalian LIGHT (Fig. 1⇑). Synteny analysis of Fugu and Tetraodon both showed complement C3a/C4a/C5a anaphylatoxin, glycosyl transferase, thioredoxin, and olfactomedin-like gene complex, and 4-1BBL downstream of LIGHT, with TM EMP 24 domain, IFN-induced GTP-binding MX, D dopachrome tautomerase, and two BTB/POZ domains were located upstream of LIGHT with the same orientation (Fig. 7⇓A). Human Chr 19 also has complement, IFN-induced GTP-binding MX, and TM EMP 24 domain genes as well; however, they are all located upstream of human LIGHT. CD27L appears to be missing from the Tetraodon and Fugu locus. Synteny and expression of LIGHT and 4-1BBL. A, Diagram of synteny of genes between Fugu, Tetraodon, and human LIGHT/4-1BBL locus. B, Semiquantitative PCR analysis (nonvariant-specific primers: S. salar LIGHT F1 and S. salar LIGHT R1) of LIGHT expression across a panel of healthy adult rainbow trout tissues. C, LIGHT amino acid sequence alignment. Putative TMDs are indicated by solid underlines, cysteines and individual β-strands (A-H) are shaded, and the locations of introns within the gene sequence are denoted by a short, bold underline. D, 4-1BBL amino acid sequence alignment. Abbreviations: Hs, Homo sapiens; Rn, Rattus norvegicus; Mm, Mus musculus; Om, O. mykiss; Ga, Gasterosteus aculeatus; Pp, Pimephales promelas; Tn, T. nigroviridis. LIGHT sequences from rainbow trout were found by combining PCR and 5′ and 3′ RACE products generated from splenic tissue (Table III⇑). One PCR product and a 5′ and 3′ RACE product overlapped in 240 identical bps to construct the 1360-bp sequence of LIGHT v1. LIGHT v2 consisted of a PCR and a 5′ RACE product, which overlapped for 318 bp of identical sequence. LIGHT v3 was constructed from a PCR and a 3′ RACE product, which overlapped for 458 bp of identical sequence. Translation of LIGHT v1 and v2 both predicted a 251-aa peptide, whereas LIGHT v3 translated into a 159-bp partial amino acid peptide. Interestingly, the conserved cysteine in mammals, located in the EF loop, is present in pufferfish but not in the trout sequences (Fig. 7⇑C). Mammalian LIGHT has been shown to be expressed on T cells and immature dendritic cells (24, 25) and is instrumental in T cell homeostasis and stimulation of monocyte and neutrophil bactericidal activity via the herpes virus entry mediator receptor (26). The highest constitutive expression of LIGHT in unstimulated rainbow trout was observed in the spleen, PBL, gill, kidney, and intestine (Fig. 7⇑B). Although functional assays were not conducted, high constitutive LIGHT expression in rainbow trout appears to occur in the primary hemopoietic tissues and tissues with direct contact to the external environment. This may indicate rainbow trout LIGHT has similar immunological or organogenesis functions as in mammals. Further work in this area is needed to define the specific roles LIGHT plays in these functions. To a lesser extent, LIGHT expression was observed in the liver, skin, and heart (Fig. 7⇑B). Four 4-1BBL orthologs were found from Tetraodon, Fugu, Zebrafish, and Stickleback EST and genomic database searches (Fig. 7⇑, A and D). Further evidence supporting the identification of 4-1BBL orthologs is that we have isolated a rainbow trout gene with similarities to the 4-1BB receptor (G. D. Wiens, unpublished data). Interestingly, phylogenetic analysis suggests that mammalian CD27L is closely related to mammalian 4-1BBL, suggesting that CD27L arose recently by cis-duplication of 4-1BBL (Fig. 1⇑). Alternatively, CD27L may have been lost in teleosts by deletion. Rainbow trout 4-1BBL has not yet been identified. Strong synteny was observed between the Tetraodon FasL loci and its human FasL ortholog. Analysis showed IFN-induced GTP-binding MX, phosphatidylinositol-N-acetylglucosaminyltransferase, and bipartite nuclear localization signal are downstream of Tetraodon FasL, whereas these same genes are upstream of human FasL while still in the same orientation (Fig. 8⇓A). The locations of cysteines in the C-D loop and E-F loops are highly conserved between fish and mammalian FasL sequences (Fig. 8⇓C). The human Chr 1 has two TNFSF ligand members (OX40L and GITRL) downstream of FasL, while orthologs to these two genes appear to be missing from the Tetraodon locus. Upstream of Tetraodon FasL are three RAL genes, fibrinogen, and an unknown gene labeled PF06702. Human orthologs to these Tetraodon genes are located downstream of FasL with similar orientation on Chr 1. It is noteworthy that both FasL and LIGHT, which group closely by phylogenetic analysis, both lack the adjacent TNFSF member(s) found in mammals. Synteny and expression of FasL. A, Diagram of synteny of genes between Fugu, Tetroadon, and human FasL locus. B, Semiquantitative PCR analysis (primers FasL F1 and FasL R1) of FasL expression across a panel of healthy adult rainbow trout tissues. C, FasL amino acid sequence alignment. Putative TMDs are indicated by solid underlines, cysteines and individual β-strands (A-H) are shaded, and the locations of introns within the gene sequence are denoted by a short, bold underline. Abbreviations: Hs, Homo sapiens; Mm, Mus musculus; Gg, Gallus gallus; Xt, X. tropicalis; Dr, D. rerio; Om, O. mykiss. Two separate rainbow trout FasL clones were identified (tcbi0027c.i.17-927 bp, tcba0001c.n.08-930 bp) that were identical in their coding regions and 3′ UTR, except for the poly(A) tail length (Table III⇑). Multiple attempts at obtaining the 5′ region by RACE were unsuccessful; therefore, nucleotide translation predicted a partial 185-aa peptide for both clones. Both FasL clone inserts contained a stop codon in the 5′ region. With this in mind, these sequences could potentially be pseudogenes or partially spliced cDNAs. Rainbow trout FasL had highest similarity to human and Xenopus LIGHT. However, the trout sequence did share its highest similarity (40%) and identity (28.4%) with zebrafish FasL, whose highest similarity is with human FasL. This underscores the close evolutionary relationship between FasL and LIGHT. The highest constitutive expression of rainbow trout FasL was observed in the spleen, PBL, gill, and intestine. To a lesser extent, FasL expression was observed in the skin, PK, AK, and heart tissues (Fig. 8⇑B). Further research is needed to determine, if present, the full rainbow trout FasL sequence and to pinpoint its immunostimulatory and/or apoptotic roles. While this article was in preparation, a novel TNFSF member was described in teleosts and designated TNF-New (14, 15). Kono et al. (15) postulated that this gene is related to mammalian LT-β. However, in our phylogenetic analysis, the location of TNF-New was unstable, grouping sometimes with TNF-α/LT-α, other times with CD30L/GITRL, and other times with EDA/BAFF/APRIL/BALM sequences. However, we have never observed grouping with mammalian LT-β. For Trout TNF-New, the highest sequence similarity and identity values were with pufferfish and zebrafish TNF-N orthologs (data not shown) and human TNF-α (Table II⇑). Interestingly, Fr_TNF-N was most similar to human LT-α, while zebrafish TNF-New was most similar to human OX40L and then Xenopus TNF-α. It should be noted that the percent sequence identity among fish and human TNFSF is quite low. Two TNF-New variants were identified from rainbow trout. The initial sequencing of clone 1RT149_E_07 described a partial sequence with errors in the 3′ end. The second variant sequence was found by combining multiple PCR and 3′ RACE products (Table III⇑). PCR was conducted (Om TNF-N F1, R4) to obtain a complete ORF from the total RNA extracted from the kidney of an unstimulated rainbow trout. This PCR product and a 3′ RACE product from splenic tissue overlapped in 459 identical bps and were combined to construct the full cDNA of Om TNF-N v1, totalling 962 bp (Fig. 8⇑A). The second variant consisted of two PCR products from gill tissue overlapping a 3′ RACE product from splenic tissue to construct a 788-bp partial sequence. The Om TNF-New v2 construct consisted of 180 overlapping nt with an identical 590-bp ORF. Two nucleotide differences were observed between two products at position 604 and 605 in the 3′ UTR. Fourteen amino acid substitutions were observed when the overlapping amino acid sequences of the two variants were compared (Fig. 9⇓A). Seven of the 14 substitutions were conserved. These sequences probably represent duplicated genes, which are commonly found in salmonids, since they have undergone recent genome duplication. Recently, we have identified several bacterial artificial chromosome clones that contain both trout TNF-α1 and TNF-New_v1, indicating that the genomic arrangement of these genes is similar between trout and other teleosts (Fig. 9⇓B and data not shown). Amino acid alignment, synteny, and expression of TNF-N and multiple sequence alignment of TL1A. A, Multiple alignment of deduced amino acid sequence for TNF superfamily member New (Om TNF-New) from rainbow trout with other teleost homologs. Putative signal peptide is indicated by dotted line and < >, whereas putative TMDs are indicated by solid underlines. Putative TMDs are indicated by solid underlines, cysteines and individual β-strands (A-H) are shaded, and the locations of introns within the gene sequence are denoted by a short, bold underline. Abbreviations: Dr, D. rerio; Fr, F. rubripes; Om, O. mykiss. B, Synteny between two zebrafish loci, one fugu and human TNF-α locus. C, Graphic representation of semiquantitative PCR analysis (primers designed from Om TNF-N v1: Om TNFSF-N F2 and Om TNFSF-N R2) of Om_TNF-N expression across a panel of healthy adult rainbow trout tissues. D, Multiple amino acid sequence alignment of mammalian, chicken, and fish TL1A and TL1A-like sequences. Abbreviations: Hs, Homo sapiens; Pt, Pan troglodytes; Rn, Rattus norvegicus; Gg, Gallus gallus; Dr, D. rerio. Interestingly, trout TNF-New v1 contains a cysteine in the putative F β-strand, which is similar to the EDA, BAFF, APRIL, and BALM cysteine organization (Fig. 9⇑A). This differs from all TNF-α and LT-α sequences we analyzed that both contain conserved cysteines in the C-D loops and E-F loops, while all mammalian LT-β sequences have a conserved cysteine in the C β-strand similar to RANKL, CD40L, and TWEAK (Supplementary Data 2). 5 Modeling of the secondary structure of trout TNF-New suggested more similarity to TNF-α and LT-α than to LT-β (Supplementary Data 2). 5 Thus, from our analyses, the precise relationship between TNF-New and other mammalian TNFSF members remains uncertain. The highest constitutive expression of rainbow trout TNF-New, using nonvariant-specific primers, was observed in the PK, PBL, AK, gill, and intestine. To a lesser extent, TNF-N expression was observed in the spleen, skin, and heart tissues (Fig. 9⇑C). Kono et al. (15) also observed highest expression across a tissue panel in the intestine, gill, and kidney. Only one fish TL1A ortholog was found in our searches. This ortholog was found in zebrafish and shares two conserved cysteines in the TMD and one cysteine between the TMD and THD regions with mammalian TL1A sequences (Fig. 9⇑D). Although amino acid sequence similarities indicate a TL1A-like protein, the phylogenetic analysis positioned Dr_TL1A-like with X. tropicalis TNF-α (Fig. 1⇑), indicating the evolution of these proteins is complex and not easily resolved from the species examined. The TNF superfamily is an ancient family of proteins that, similar to TLRs, can be identified in the Ecdysozoan clade of bilateral animals. Drosophila has one known TNF homolog encoded by the gene, eiger (27, 28). Eiger binds a type I membrane receptor, Wengen, and activates signal transduction components that are similar to the mammalian TNF signal cascade (29, 30). 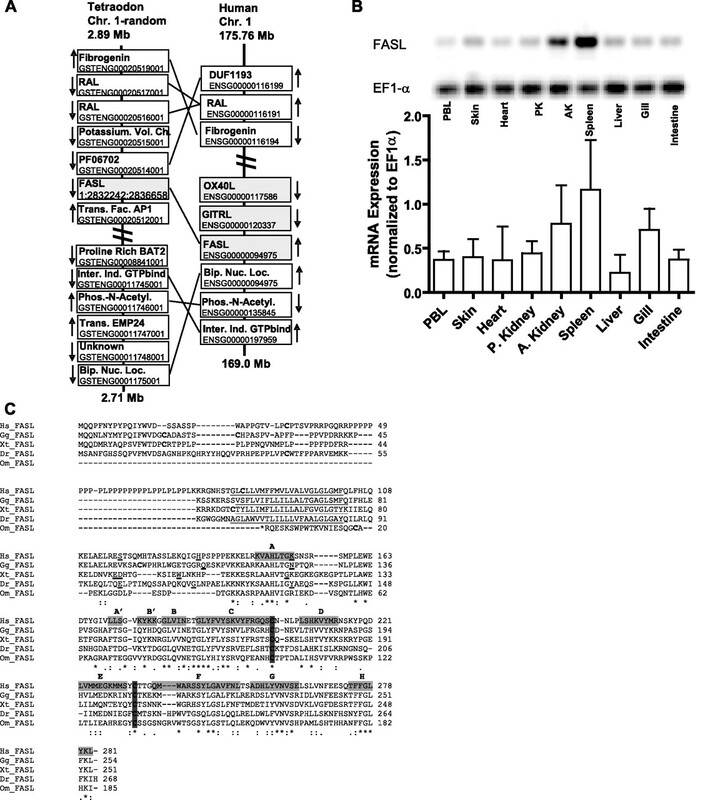 Furthermore, mutations in eiger delay the lethality in Salmonella-infected flies, implicating a functional role for eiger in a condition that resembles TNF-induced metabolic collapse in vertebrates (31). In all TNFSF members, the THD, on the protein C terminus, form a trimer that is structurally similar to the C1q family of proteins (32). The C1q family is an expanding group of proteins, including adiponectin, CORS-26, precerebelin, hibernation protein, type X collagen, type VIII collagen, emilin-1 through 4, and multimerin that have diverse immune and nonimmune functions (32). In this study, we have restricted our analysis to TNFSF members and demonstrate that many mammalian TNFSF members have orthologs in teleosts. To our knowledge, the phylogenetic tree (Fig. 1⇑) is the most inclusive analysis of fish TNFSF ligands described to date. Fourteen distinct teleost TNFSF members were identified. It is striking that no clear TNFSF orthologs were found for mammalian OX40L, CD27, CD30L, and GITRL. The fact that none of these genes were found across a number of teleost genome sequences and EST databases lends support to their loss and or absence. However, given the large number of teleost species (>20,000), it is possible that the TNFSF repertoire may be different depending on fish species examined and the degree of selective gene loss or duplication. For example, in a comparison between zebrafish and Tetraodon gene duplicates, only half remain in either of the zebrafish or Tetraodon genomes presumably due to gene loss or rearrangement (33). Interestingly, the genome of the chicken is missing orthologs of eight mammalian genes, which are present in three tandem clusters in the mammalian genome (TNF, LT-A, and LT-B; LIGHT, CD27L, and 4-1BBL; APRIL and TWEAK) (34). The portrait of missing teleost TNFSF members is not as clear as in chickens and may, in large, be attributed to multiple teleost en bloc and genome duplications, which obscures the evolutionary picture. It is also possible that we are unable to recognize these genes due to a high sequence divergence. Analysis of the receptors may be required to clarify the status of the missing ligands. The association of homeobox (HOX) clusters has aided in deciphering the origin of teleost chemokine and chemokine receptors families and has shown that en bloc and tandem duplications have been a common source of these genes (35). A similar, but more indistinct, picture appears to be present with the TNFSF ligands as depicted in our evolutionary model (Fig. 10⇓). Groups of TNFSF ligands are found in tandem and phylogenetic relationships and are present between these tandem clusters, indicating the occurrence of en bloc or genome duplications. For example, mammalian LIGHT, CD27L, and 4-1BBL are found in tandem on Chr 19 of the human genome (Fig. 9⇑). LIGHT and 4-1BBL were found in our search in Tetraodon and Fugu, whereas CD27L was absent. A similar circumstance is present with FasL (likely ancestry with LIGHT), which was found in Tetraodon, zebrafish, and rainbow trout, whereas GITRL and OX40L were absent. Mammalian FasL, GITRL, and OX40L are found in tandem of human Chr 1. Comparative analysis of human and teleost TNFSF chromosomal location, exon organization, transcriptional direction, and extension of a model of TNFSF evolution proposed by Collette et al. (4 ). Dashed lines indicate significant phylogenetic relationships, whereas dotted lines indicate weak phylogenetic grouping from Fig. 1⇑. Blocks indicate exons and arrows indicate transcriptional direction. TNFSF members, which we were unable to find, or exons in fish that are uncertain are indicated (?). This model assumes that the blocks of TNFSF genes originally arose from genome-wide or chromosomal duplications of the metazoan ancestor to the early vertebrates. The ancestral TNFSF gene organization before the bony fish-tetrapod split, ∼360–450 mya (48 ), can be deduced from the common gene organization. Blocks of two genes appear to be the original TNFSF unit, whereas blocks of three TNFSF appear to be a derived characteristic. The most parsimonious explanation suggests that cis-duplication led to 4-1BBL-CD27L pair and also to the TNF-α-LTα pair occurring after the fish-tetrapod split. Translocation may have contributed to the placement of BALM next to EDA in teleost genomes and is shown by an arrow. It is possible that the precursor of TNF-New gave rise to GITRL/CD30L as suggested from phylogenic analysis. Alternatively, TNF-New, which is in the same location (next to TNF-α), and transcriptional orientation as mammalian LT-α may be a degenerate form of the precursor of LT-α. The evolutionary origin of LT-β is unclear but may have arisen from a translocation of a related TNFSF member, which in teleosts may have included a translocated TNF-α gene or TL1A-like gene. Abbreviations: Chr, chromosome; Dr, D. rerio; Tn, T. nigroviridis; TNFSF, TNF superfamily. Exon size and distances are not drawn to scale and splice variants are not shown. To further verify that we were not missing fish TNFSF orthologs (CD27L, GITRL, and OX40L) associated with the mammalian LIGHT and FasL loci mentioned above, we scanned the associated fish genomic sequence obtained from the Ensembl Tetraodon database through WU-BLAST (program, blastx; database, nrdb95) to search for potential TNFSF ORFs in all six reading frames (http://dove.embl-heidelberg.de/Blast2/). We were unable to locate any TNFSF members from the genomic sequence between LIGHT and 4-1BBL (Chr 18) and between FasL and Trans. Fac. AP-1 (Chr 1-random). However, the 64,368 bases of genomic sequence analyzed downstream of Tetraodon FasL did contain 3,056 bases of uncharacterized “n” sequence. An interesting observation is that the majority of these absent mammalian members are instrumental in T cell regulation and homeostasis. This may indicate a fundamental difference between the teleost and mammalian immune system and specifically adaptive immunity. The current search established only one conclusive TNFSF “triplet” of genes (BALM-EDA-CD40L), and this organization is unique to teleosts (Fig. 10⇑). This supports the proposal of Collette et al. (4) that the “ancestral” TNFSF organization is two genes. Recently, further support for this organization is observed in the purple sea urchin genome (36). Four TNFSF have been identified, and two of these genes, Sp_TNFSF-like 1 and SP_TNFSF-like 2, are within 30 kb of one another. The predicted protein sequence of SP_TNFSF-like 1 groups at the root of the EDA-BAFF-BALM-APRIL sequences while Sp_TNFSF-like2 groups weakly with Fr_TNF-new by phylogenetic analysis (data not shown). Further analyses of TNFSF members from additional intermediate species are required to resolve the complex evolution of these ancestral genes. The location of BALM adjacent to EDA suggests a local duplication or translocation not found in higher vertebrates (Fig. 10⇑). BALM was found to be located on the same chromosome with EDA for Tetraodon (Chr 1) and Fugu (scaffold 663). 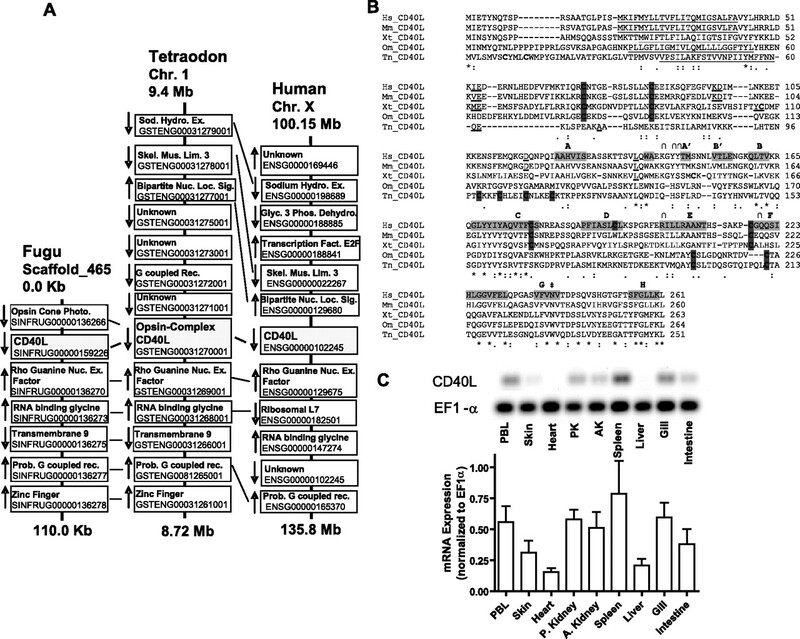 TNFSF5 (CD40L) was also found on Tetraodon Chr 1, while it is still unclear if Fugu CD40L (scaffold 465) is on the same chromosome with EDA and BALM due to the current inconclusive scaffold organization of the genome. Zebrafish CD40L is located on Chr 14, whereas no data are available on the location of a zebrafish EDA. A tblastn hit of (8.1e-70) was observed in zebrafish with a partial S. salar EDA (TIGR: TC27579) as query. Preliminary searches indicated the possibility of a second triplet consisting of APRIL, TWEAK, and TRAIL-like located on zebrafish Chr 7, which is partially consistent with the organization of APRIL and TWEAK on human Chr 17. However, the more recent Ensembl release 41 for zebrafish (assembly Zv6) shows that TWEAK and TRAIL-like_v2 are located on Chr 7, while APRIL and TRAIL-like_v4 are present on Chr 5. The location of BAFF and RANKL-like on Tetraodon Chr 2 also coincides with Chr 13 in humans (Fig. 10⇑). In summary, gene organization has been conserved for many of the TNFSF members with putative gene translocation, gene loss, and truncated clusters as has been reported for the hox gene family in teleosts (37). Colosimo et al. (12) characterized threespine stickleback EDA and have started to reveal its role in scale/plate development. They also described a gene within the stickleback EDA locus and, due to its characteristics, called it stickleback TNF (ligand) superfamily member 13b (BAFF). Upon closer observation, we determined this stickleback TNFSF 13b gene to be an ortholog of rainbow trout BALM. Because teleost BALM shows characteristics of both BAFF and APRIL, it may be an ancient precursor or have emerged from a teleost-specific duplication. Although the receptor is at present unknown, it is interesting that BAFF, and also one splice variant of APRIL, bind to three different receptors BCMA, BAFF-R, and TACI (38). Thus, BALM may be the third ligand in this set that was lost during higher vertebrate evolution. Interestingly, rainbow trout BALM expression is highest in the blood and lymphoid organs similar to trout BAFF and APRIL. Further functional analyses are underway to elucidate the receptor specificity and role of these closely related proteins in rainbow trout. In humans and mice, CD40L is primarily expressed on CD4+T cells. In the absence of CD40-CD40L interaction between T cells and APCs, macrophages are unable to up-regulate costimulatory molecules, and B cells are unable to proliferate and switch Ig class. The synteny between teleost and human CD40L loci appears to be strong, while CD40-CD40L binding and glycosylation sites are not conserved. Currently, isotype switch regions have not been found in rainbow trout (39), and it has been proposed that progenitor B cells become either of two Ig lineages (40). With this in mind, teleost CD40L may be playing a limited or alternative role to its mammalian orthologs. While our manuscript was in preparation, we observed a Japanese flounder TNFSF protein had been reported to be an ortholog of mammalian FasL (41). This conclusion was based on phylogenetic analysis with three mammalian TNFSF members: TNF-α, LT-α, and FasL. Our phylogenetic analyses using all available sequences indicate that this flounder sequence groups strongly with teleost and mammalian CD40L sequences and not with the teleost and mammalian FasL sequences (data not shown), underscoring the limitations of phylogenetic analysis using limited sequences and the importance of including the analysis of gene synteny. Interestingly, the Japanese flounder protein induced apoptosis of HINAE cells-derived Japanese flounder embryos, suggesting a novel bioactivity for teleost CD40L. Possibly, this may relate to the recently uncovered role of murine CD40L in immune homeostasis. Naive CD4+T cells expressing CD40L have been shown to augment the survival of autoantigen-engaged B cells (42). This homeostatic/apoptotic function may be the primary role of CD40L in lower vertebrates, whereas its role further expanded through mammalian evolution. Recently, Kono et al. (15) characterized almost identical sequences to rainbow trout TNF-New v1 and TNF-New v2. Through phylogenetic analysis with mammalian and frog TNF-α, LT-α, and LT-β, they propose TNF-New to be the ortholog of mammalian LT-β. We have included all 18 mammalian TNF ligand members and have shown (Fig. 1⇑) that rainbow trout TNF-N v1 groups with Fugu and zebrafish TNF-N but have not observed grouping with LT-β in any of the trees constructed. The present results are similar to the phylogenetic analysis findings of Savan et al. (14), who found Fugu and zebrafish TNF-New to form a distinct cluster separated from TNF-α, LT-α, and LT-β. 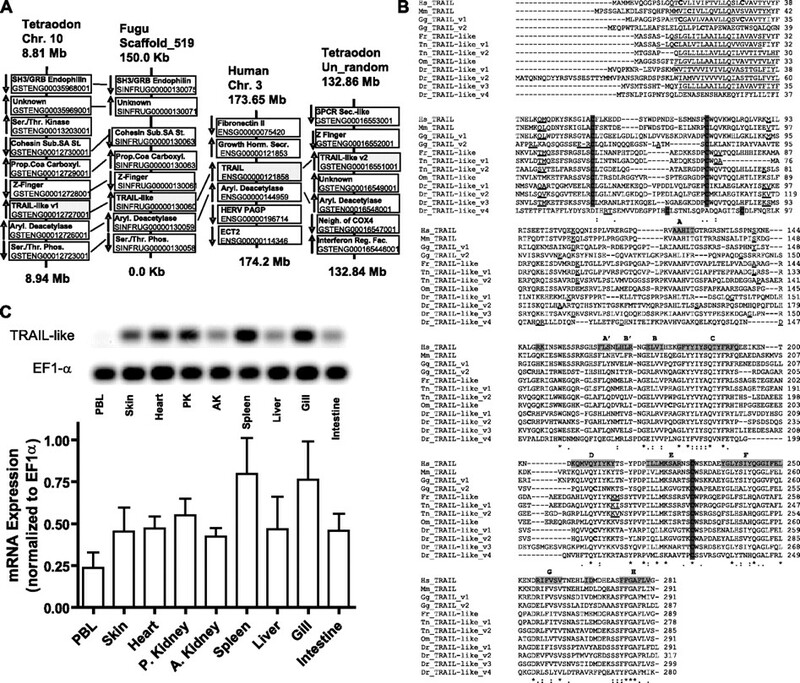 Synteny analysis indicates that the Fugu and zebrafish TNF-New orthologs are located on the same scaffolds as TNF, share synteny with human Chr 6, which contains TNF, LT-A, and LT-B, and shares the same transcriptional direction as mammalian LT-A (15). TNF-New shares closest percent amino acid identity with human TNF-α (22%), then followed by LT-α (18.5%) and finally LT-β (16.7%). Furthermore, SignalP 3.0 predicts a signal peptide on TNF-New similar to LT-α (data not shown). Thus, our results suggest that rainbow trout TNF-N is also similar to mammalian LT-α. Interestingly, zebrafish have two copies of TNF, one of which is present on Chr 15 next to TNF-New, whereas a second TNF is located by itself on Chr 19 (Fig. 8⇑B). The TNF gene on zebrafish Chr 19 is surrounded by the largest stretch of MHC-related genes, while a number of other class III genes are found distributed throughout the genome (43). This organization is in abrupt contrast to that of Xenopus in which the LT-B, TNF, and LT-A genes and the extended MHC is organized in very similar manner to mammals (44). Functional analysis and examination of this locus in additional transitional vertebrate species are required to resolve the evolutionary relationship between teleost TNF-New with TNF-α, LT-α, and LT-β and costimulatory ligands OX40L, GITRL, and CD30L. Seven HOX clusters have been found in the zebrafish genome, suggesting an additional genome duplication in fish compared with higher vertebrates (35). In salmonids, the situation is even more complex as 14 hox gene clusters have been identified (45), suggesting that salmonids have undergone an additional genome duplication estimated to occur ∼25 million years ago (46). This makes it likely that additional gene duplicates will be identified in trout. The presence of multiple forms of TNF-α, LIGHT, BALM, and TNF-New suggests that redundant and/or divergent systems are tolerated within salmonids. In teleosts, TRAIL-like molecules are particularly complex as we have identified four related genes in Zebrafish in agreement with recently published findings from Eimon et al. (23). Expression analysis indicates the majority of the rainbow trout ligands are constitutively expressed in hemopoietic tissue and tissues with direct contact to the aquatic environment. This would indicate that many of the same organogenesis and immunological pathways present in mammals could be functioning at some similar capacity in fish. Notable exceptions are the absence of lymph nodes in teleosts or the organization of the spleen into distinct white and red pulp areas. It is possible that the rearrangement or partial duplication of teleost TNF and TNF-New into the LTB-TNF-LT-A gene locus may have been a driving force in the evolution of these structures in tetrapods. In summary, in addition to TNF-α, there are at least 13 distinct TNFSF members present in teleosts. We demonstrate for the first time that teleosts possess orthologs of BAFF, APRIL, TWEAK, 4-1BBL, FasL, LIGHT, CD40-L, RANKL, and possibly TL1A. Teleosts have a unique TNFSF member (BALM), along with multiple variant forms of mammalian orthologs such as TNF-α, TRAIL, and LIGHT. At this point, we have been unable to find four TNFSF members (CD27L, OX40L, GITRL, and CD30L), which have a propensity to cluster in our analysis as well as other phylogenetic trees in the literature (4). The majority of these absent ligands are instrumental in T cell activation and homeostasis (1, 3, 4, 47). There are three explanations for their absence: 1) an artifact of the incomplete assembly of the genomes examined, 2) they may have been lost during teleost evolution, 3) or may have arisen under pressures of the adaptive immune systems of higher vertebrates. Further analyses are required to distinguish between these possibilities. We believe the current analysis of TNFSF in teleosts sheds new light into teleost and higher vertebrate comparative immunology and are the basis for future functional studies. We thank Katherine Hovatter for her technical expertise in the lab and Drs. C. Rexroad and Y. Palti for supplying EST clones. We thank Dr. Pascal Schneider, University of Lausanne; Dr. Susan Murray, Oregon Health and Science University; Dr. Ram Savan, Laboratory of Experimental Immunology, National Cancer Institute, Center for Cancer Research, National Institutes of Health; and Dr. Hyun Lillehoj Beltsville Agricultural Research Center, for discussions and critical review of this manuscript. Mention of trade names or commercial products in this publication is solely for the purpose of providing specific information and does not imply recommendation or endorsement by the U.S. Department of Agriculture. ↵2 Current address: United States Fish and Wildlife Service, Northeast Fishery Center-Fish Health Center, P.O. Box 155, Lamar, PA 16848. ↵4 Abbreviations used in this paper: TNFSF, tumor necrosis factor superfamily; AK, anterior kidney; APRIL, a proliferation-inducing ligand; BAFF, B cell-activating factor; BALM, BAFF-APRIL-like molecule; EDA, ectodysplasin; EST, expressed sequence tag; FasL, Fas ligand; GITRL, glucocorticoid-induced TNFR-related gene ligand; HOX, homeobox; LIGHT, lymphotoxin-like inducible protein that competes with glycoprotein D for binding herpesvirus entry mediator on T cell; LT, lymphotoxin; ORF, open reading frame; PK, posterior kidney; RANKL, receptor activator of NF-κB; THD, TNF homology domain; TL1A, TNF ligand-related molecule 1; TM, transmembrane; TMD, transmembrane domain; TRAIL, TNF-related apoptosis inducing ligand; TWEAK, TNF-like weak inducer of apoptosis; UTR, untranslated region. ↵5 The online version of this article contains supplemental material. Bodmer, J. L., P. Schneider, J. Tschopp. 2002. The molecular architecture of the TNF superfamily. Trends Biochem. Sci. 27: 19-26. Ware, C. F.. 2003. The TNF superfamily. Cytokine Growth Factor Rev. 14: 181-184. Locksley, R. M., N. Killeen, M. J. Lenardo. 2001. The TNF and TNF receptor superfamilies: integrating mammalian biology. Cell 104: 487-501. Collette, Y., A. Gilles, P. Pontarotti, D. Olive. 2003. A co-evolution perspective of the TNFSF and TNFRSF families in the immune system. Trends Immunol. 24: 387-394. Hirono, I., B. H. Nam, T. Kurobe, T. Aoki. 2000. 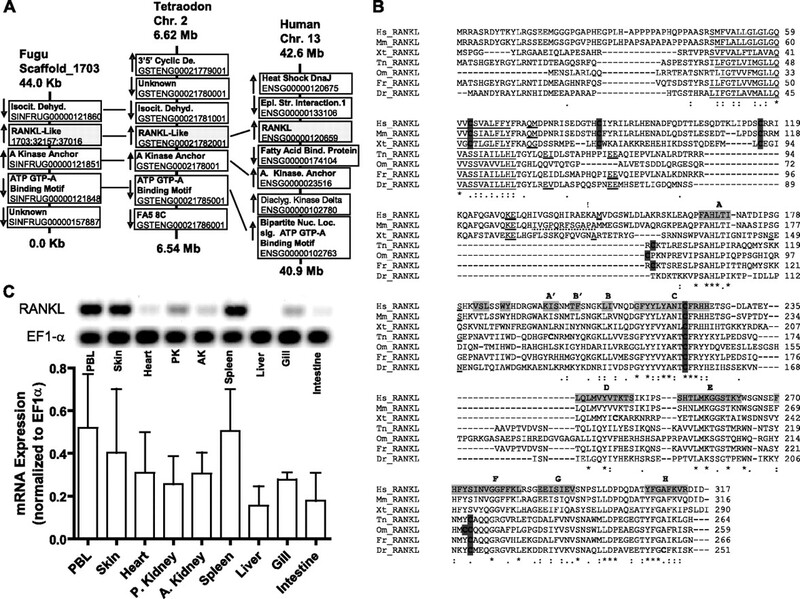 Molecular cloning, characterization, and expression of TNF cDNA and gene from Japanese flounder Paralychthys olivaceus. J. Immunol. 165: 4423-4427. Laing, K. J., T. Wang, J. Zou, J. Holland, S. Hong, N. Bols, I. Hirono, T. Aoki, C. J. Secombes. 2001. Cloning and expression analysis of rainbow trout Oncorhynchus mykiss tumour necrosis factor-α. Eur. J. Biochem. 268: 1315-1322. Garcia-Castillo, J., P. Pelegrin, V. Mulero, J. Meseguer. 2002. Molecular cloning and expression analysis of tumor necrosis factor α from a marine fish reveal its constitutive expression and ubiquitous nature. Immunogenetics 54: 200-207. Savan, R., M. Sakai. 2004. Presence of multiple isoforms of TNF α in carp (Cyprinus carpio L.): genomic and expression analysis. Fish Shellfish Immunol. 17: 87-94. Zou, J., C. J. Secombes, S. Long, N. Miller, L. W. Clem, V. G. Chinchar. 2003. Molecular identification and expression analysis of tumor necrosis factor in channel catfish (Ictalurus punctatus). Dev. Comp. Immunol. 27: 845-858. Praveen, K., D. L. Evans, L. Jaso-Friedmann. 2006. Constitutive expression of tumor necrosis factor-α in cytotoxic cells of teleosts and its role in regulation of cell-mediated cytotoxicity. Mol. Immunol. 43: 279-291. Bobe, J., F. W. Goetz. 2001. Molecular cloning and expression of a TNF receptor and two TNF ligands in the fish ovary. Comp. Biochem. Physiol. B Biochem. Mol. Biol. 129: 475-481. Colosimo, P. F., K. E. Hosemann, S. Balabhadra, G. Villarreal, Jr, M. Dickson, J. Grimwood, J. Schmutz, R. M. Myers, D. Schluter, D. M. Kingsley. 2005. Widespread parallel evolution in sticklebacks by repeated fixation of ectodysplasin alleles. Science 307: 1928-1933. Goetz, F. W., J. V. Planas, S. MacKenzie. 2004. Tumor necrosis factors. Dev. Comp. Immunol. 28: 487-497. Savan, R., T. Kono, D. Igawa, M. Sakai. 2005. A novel tumor necrosis factor (TNF) gene present in tandem with the TNF-α gene on the same chromosome in teleosts. Immunogenetics 57: 140-150. Kono, T., J. Zou, S. Bird, R. Savan, M. Sakai, C. J. Secombes. 2006. Identification and expression analysis of lymphotoxin-β like homologues in rainbow trout Oncorhynchus mykiss. Mol. Immunol. 43: 1390-1401. Thorgaard, G. H., G. S. Bailey, D. Williams, D. R. Buhler, S. L. Kaattari, S. S. Ristow, J. D. Hansen, J. R. Winton, J. L. Bartholomew, J. J. Nagler, et al 2002. Status and opportunities for genomics research with rainbow trout. Comp. Biochem. Physiol. B Biochem. Mol. Biol. 133: 609-646. Karpusas, M., Y. M. Hsu, J. H. Wang, J. Thompson, S. Lederman, L. Chess, D. Thomas. 1995. 2 A crystal structure of an extracellular fragment of human CD40 ligand. Structure 3: 1031-1039. Hymowitz, S. G., D. R. Patel, H. J. Wallweber, S. Runyon, M. Yan, J. Yin, S. K. Shriver, N. C. Gordon, B. Pan, N. J. Skelton, et al 2005. Structures of APRIL-receptor complexes: like BCMA, TACI employs only a single cysteine-rich domain for high affinity ligand binding. J. Biol. Chem. 280: 7218-7227. Lam, J., C. A. Nelson, F. P. Ross, S. L. Teitelbaum, D. H. Fremont. 2001. Crystal structure of the TRANCE/RANKL cytokine reveals determinants of receptor-ligand specificity. J. Clin. Invest. 108: 971-979. Cha, S. S., B. J. Sung, Y. A. Kim, Y. L. Song, H. J. Kim, S. Kim, M. S. Lee, B. H. Oh. 2000. Crystal structure of TRAIL-DR5 complex identifies a critical role of the unique frame insertion in conferring recognition specificity. J. Biol. Chem. 275: 31171-31177. Wiens, G. D., G. W. Glenney, S. E. Lapatra, T. J. Welch. 2006. Identification of novel rainbow trout (Onchorynchus mykiss) chemokines, CXCd1 and CXCd2: mRNA expression after Yersinia ruckeri vaccination and challenge. Immunogenetics 58: 308-323. Bajorath, J., N. J. Chalupny, J. S. Marken, A. W. Siadak, J. Skonier, M. Gordon, D. Hollenbaugh, R. J. Noelle, H. D. Ochs, A. Aruffo. 1995. Identification of residues on CD40 and its ligand which are critical for the receptor-ligand interaction. Biochemistry 34: 1833-1844. Eimon, P. M., E. Kratz, E. Varfolomeev, S. G. Hymowitz, H. Stern, J. Zha, A. Ashkenazi. 2006. Delineation of the cell-extrinsic apoptosis pathway in the zebrafish. Cell Death Differ. 13: 1619-1630. Tamada, K., K. Shimozaki, A. I. Chapoval, Y. Zhai, J. Su, S. F. Chen, S. L. Hsieh, S. Nagata, J. Ni, L. Chen. 2000. LIGHT, a TNF-like molecule, costimulates T cell proliferation and is required for dendritic cell-mediated allogeneic T cell response. J. Immunol. 164: 4105-4110. Granger, S. W., C. F. Ware. 2001. Turning on LIGHT. J. Clin. Invest. 108: 1741-1742. Heo, S. K., S. A. Ju, S. C. Lee, S. M. Park, S. Y. Choe, B. Kwon, B. S. Kwon, B. S. Kim. 2006. LIGHT enhances the bactericidal activity of human monocytes and neutrophils via HVEM. J. Leukocyte Biol. 79: 330-338. Igaki, T., H. Kanda, Y. Yamamoto-Goto, H. Kanuka, E. Kuranaga, T. Aigaki, M. Miura. 2002. Eiger, a TNF superfamily ligand that triggers the Drosophila JNK pathway. EMBO J. 21: 3009-3018. Moreno, E., M. Yan, K. Basler. 2002. Evolution of TNF signaling mechanisms: JNK-dependent apoptosis triggered by Eiger, the Drosophila homolog of the TNF superfamily. Curr. Biol. 12: 1263-1268. Kauppila, S., W. S. Maaty, P. Chen, R. S. Tomar, M. T. Eby, J. Chapo, S. Chew, N. Rathore, S. Zachariah, S. K. Sinha, et al 2003. Eiger and its receptor, Wengen, comprise a TNF-like system in Drosophila. Oncogene 22: 4860-4867. Geuking, P., R. Narasimamurthy, K. Basler. 2005. 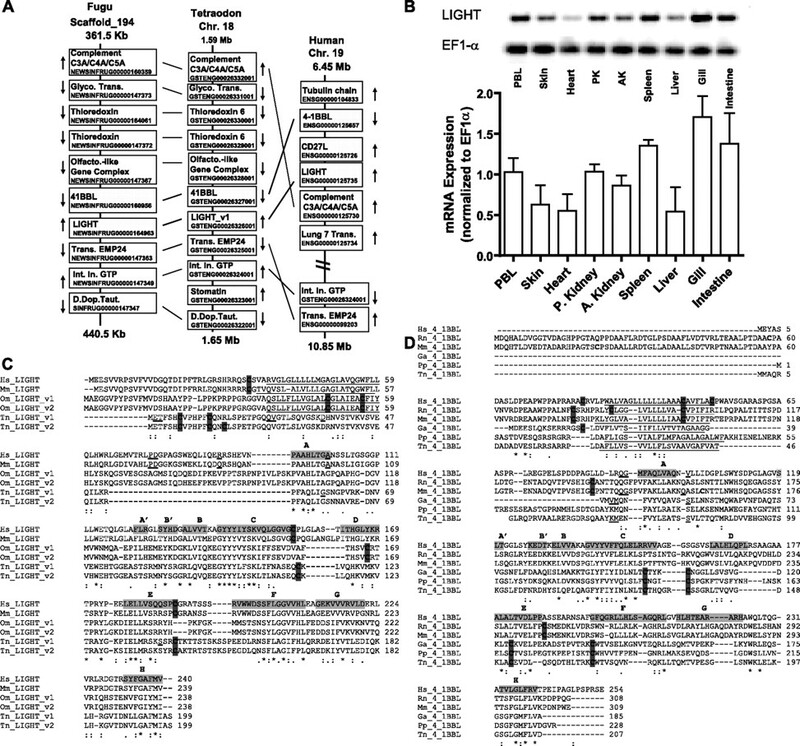 A genetic screen targeting the tumor necrosis factor/Eiger signaling pathway: identification of Drosophila TAB2 as a functionally conserved component. Genetics 171: 1683-1694. Kishore, U., C. Gaboriaud, P. Waters, A. K. Shrive, T. J. Greenhough, K. B. Reid, R. B. Sim, G. J. Arlaud. 2004. C1q and tumor necrosis factor superfamily: modularity and versatility. Trends Immunol. 25: 551-561. Woods, I. G., C. Wilson, B. Friedlander, P. Chang, D. K. Reyes, R. Nix, P. D. Kelly, F. Chu, J. H. Postlethwait, W. S. Talbot. 2005. The zebrafish gene map defines ancestral vertebrate chromosomes. Genome Res. 15: 1307-1314. Kaiser, P., T. Y. Poh, L. Rothwell, S. Avery, S. Balu, U. S. Pathania, S. Hughes, M. Goodchild, S. Morrell, M. Watson, et al 2005. A genomic analysis of chicken cytokines and chemokines. J. Interferon Cytokine Res. 25: 467-484. DeVries, M. E., A. A. Kelvin, L. Xu, L. Ran, J. Robinson, D. J. Kelvin. 2006. Defining the origins and evolution of the chemokine/chemokine receptor system. J. Immunol. 176: 401-415. Rast, J. P., L. C. Smith, M. Loza-Coll, T. Hibino, G. W. Litman. 2006. Genomic insights into the immune system of the sea urchin. Science 314: 952-956. Lemons, D., W. McGinnis. 2006. Genomic evolution of Hox gene clusters. Science 313: 1918-1922. Bossen, C., K. Ingold, A. Tardivel, J. L. Bodmer, O. Gaide, S. Hertig, C. Ambrose, J. Tschopp, P. Schneider. 2006. Interactions of tumor necrosis factor (TNF) and TNF receptor family members in the mouse and human. J. Biol. Chem. 281: 13964-13971. Hansen, J. D., E. D. Landis, R. B. Phillips. 2005. Discovery of a unique Ig heavy-chain isotype (IgT) in rainbow trout: implications for a distinctive B cell developmental pathway in teleost fish. Proc. Natl. Acad. Sci. USA 102: 6919-6924. Schorpp, M., M. Bialecki, D. Diekhoff, B. Walderich, J. Odenthal, H. M. Maischein, A. G. Zapata, T. Boehm. 2006. Conserved functions of Ikaros in vertebrate lymphocyte development: genetic evidence for distinct larval and adult phases of T cell development and two lineages of B cells in zebrafish. J. Immunol. 177: 2463-2476. Kurobe, T., I. Hirono, H. Kondo, T. Saito-Taki, T. Aoki. 2007. Molecular cloning, characterization, expression and functional analysis of Japanese flounder Paralichthys olivaceus Fas ligand. Dev. Comp. Immunol. 31: 687-695. Lesley, R., L. M. Kelly, Y. Xu, J. G. Cyster. 2006. Naive CD4 T cells constitutively express CD40L and augment autoreactive B cell survival. Proc. Natl. Acad. Sci. USA 103: 10717-10722. Ohta, Y., W. Goetz, M. Z. Hossain, M. Nonaka, M. F. Flajnik. 2006. Ancestral organization of the MHC revealed in the amphibian Xenopus. J. Immunol. 176: 3674-3685. Moghadam, H. K., M. M. Ferguson, R. G. Danzmann. 2005. Evidence for Hox gene duplication in rainbow trout (Oncorhynchus mykiss): a tetraploid model species. J. Mol. Evol. 61: 804-818. Allendorf, F. W., R. G. Danzmann. 1984. Tetraploidy and the evolution of salmonid fish. J. B. Turner, Jr, ed. Evolutionary Genetics of Fish 1-53. Plenum Press, New York. Chan, K. F., M. R. Siegel, J. M. Lenardo. 2000. Signaling by the TNF receptor superfamily and T cell homeostasis. Immunity 13: 419-422. Volff, J. N.. 2005. Genome evolution and biodiversity in teleost fish. Heredity 94: 280-294.